The good thing about sweat spot training is that it is a lot of fun and rewarding. You can do quite a bit of it without excess fatigue. If you have limited training time, then I would concentrate on this sweat spot training. Effort at this intensity will bring substantially more gains than low intensity level 1 and 2. For a 100 mile TT, the bulk of your training will be endurance and tempo efforts. But, to get that extra speed, you still need to do higher intensity efforts. Once you have a sufficient base of endurance, you can incorporate much harder interval efforts. These will come later in the season, from February onwards. One session I like to do is several 5 minute hill efforts as hard as I can. This will be at an intensity above threshold effort. After 4 or 5 intervals, it is hard to keep that intensity. From what I can gather, training at this effort level not only increases your threshold power, but also helps other aspects of aerobic capacity. Hard intervals give a big bang for you buck so to speak. If training time is limited, a 2-3 hour hard interval session will give substantial improvements in threshold power. If you can increase your threshold power, then you will be able to go faster in a 100 mile TT, so long as you can maintain the distance. I use pyramid intervals for training for 10 and 25 mile TT, and I will use this fitness for 100 mile TT. Most people doing a 100 mile TT, will be racing shorter distances, 10, 25, and 50 mile TT. Obviously, this all helps towards doing a 100 mile TT, especially 50 mile TT. However, I did my first 100 mile TT after only doing a 25 mile TT. 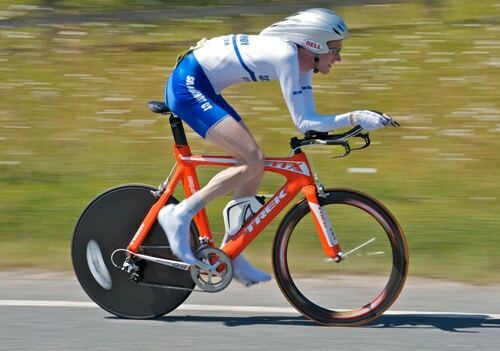 I know quite a few top time triallists, such as Michael Hutchinson, Matt Bottrill, and Mark Holton who have won the national 100 mile TT on fairly limited mileage. I don’t know exactly there training regimes, but, from what I can gather they are not mile munchers like the BBAR contenders of previous decades. They really focus on training for 10, 25 and 50 mile TT and use that time trial speed to good effect in a 100. After a few experiences of doing 100 mile time trials, I would place a lot of emphasis on training on your time trial bike. It’s one thing to get fit on a road bike, but you can turn up on your TT bike, and be in agony after two hours. If you’re not comfortable racing in your TT position for 4 hours, you are likely to end up dissappointed. This winter I’m placing a lot of emphasis on improving core body strength. If nothing else, do the ‘plank’ exercise’ and slowly build up the time you can hold the plank position; this will definitely help for any time trial. If possible, keep riding your TT bike all year. I don’t actually ride it in Nov – Jan. But, in Feb I take it down and do at least 50% of my training on the TT bike. A major part of a 100 mile TT is to get the food and hydration right. So many people train all year, then turn upto a 100 mile TT and make big mistakes in the feeding and hydration (and from bitter experience I include myself!) When training, try to replicate a four hour effort with using exactly the feeding techniques you will use in your race. Also note the temperature; a variation in temp can drastically alter the amount of hydration you need. Never get to the race and try something different you’ve never done before. So many people say their 100 mile TT gets ruined because a water bottle, they are using for the first time jumps out, leaving them without enough drink. For a 100 mile TT, you could try set off at around 85% (255watts), which will feel quite easy to start off with. After two hours you can pick up the pace, if you can. But, you may find it becomes increasingly hard to maintain that intensity as the time goes on. Of course, the more practice you can get in training and doing 50 mile TT, the better will be your knowledge of what kind of effort you can maintain. But, I would hazard a guess most beginners start off their first 100 mile TT too fast! I know I often do. Pacing in long distance TT was my main motivation for buying a power meter. If you don’t have a power meter, you can still use a heart rate monitor or just go on feel. Bear in mind a heart rate monitor is a bit more variable and there can be a delay between power and heart rate. Note: This was one of those rare hundred mile TT where the pacing was relatively good. Really interesting post Tejvan. I’m particularly interested in a 100 TT as I’m doing another Ironman next July. My previous effort wasn’t bad (11hr 40) but the bike ride wasn’t quick enough. Is it worth concentrating on hard intervals this time of year to build up speed and strength ahead of building base miles? Should I periodically remeasure my one hour effort and adjust my training based on the new threshold? seems a little early for ‘really hard intervals. Perhaps intervals just below threshold – ‘sweat spot’ in addition to the base miles. Very interesting take on 100TT training, I think sweat spot training is great for learning to sustain your power for ever longer distances. Conversely when I raced in the 80s/90s we used longer intervals early in the season working towards shorter more intense efforts later on to build speed. Today a lot of cyclists approach it from the other direction working towards longer efforts later on (say 3×20, 2×30 and 1x1hr.). Having returned to cycling after a long layoff due initially to serious injury and latterly business commitments my plan is to ride club 10’s and open 25’s with perhaps the odd 50 thrown in. As an older rider (66 in May) longer distances are difficult on a TT bike due to the more extreme position and the older you get the harder it is to attain best condition, so I pay a lot of attention to advice given so freely by guys such as yourself. Many thanks for your blog which I look forward to with anticipation each month! Thanks Ken, just bear in mind when it comes to training, I’m no expert. but pedal had hope for the best. i cycled 461 miles over 10 days with 2 days rest,with an old mountain bike and carrying all my luggage and camping equipment on my bike.i know that i had to go at a steady pace each day of 50 to 60 miles each day,if i cycled too fast my knees would start to hurt and then you can’t cycle anymore!! !.how can these top riders cycle 100 miles in four hours with going up steep hills too without there knees hurting,where you cannot cycle anymore???. The man from Wales who won the commonwealth games road cycling gold did this 105 miles in 4 hours 13 mins and cycling up a 20 percent hill 12 times a week after completing the tour de france.This is amazing to me how their knees don’t hurt??? painful knees may be something to do with position. Check saddle height. It’s also a lot easier on a light road bike without luggage! Another tip on knee pain and positioning: make sure your feet are positioned correctly. Pedalling ‘toe-in’ or ‘toe-out’ will cause muscles, ligaments and tendons to pull the knee joint out of alignment over time (a fairly short one), and this can cause excruciating pain during and after a hard ride. 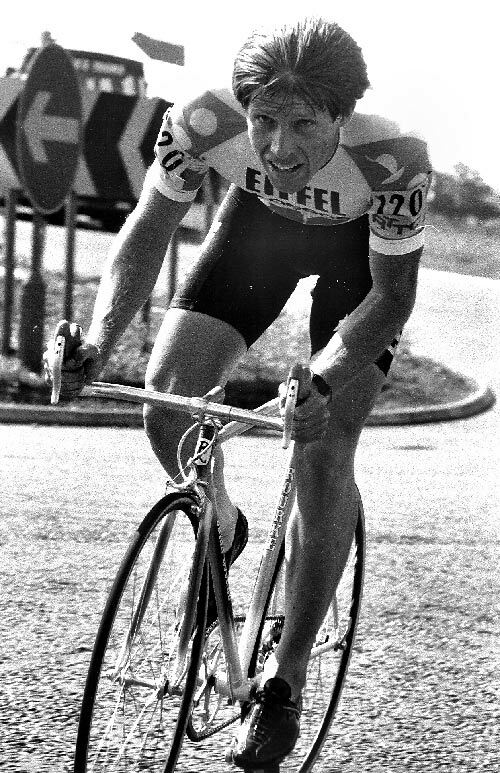 I was once lured by perceived benefits of aero-friendly feet (!) & adjusted my cleats to keep the outside of my shoes parallel to the bike-frame. After a few months of fairly heavy training and racing TTs, the pain became unbearable, but was quickly remedied after diagnosis, by simply changing to a more natural position. I really can´t believe you only avg ~260 watts and went 28 mph! I can do well over 300 watts for an hour but my avg speeds never exceeds 27 mph on a flat course 20-60 min TT. Im 184 cm and weighing 64 kg. What is going on? I’m not sure, but I think my power meter is giving readings 20-30watt lower than last year. Aerodynamics plays a big role and also the course I did a 3.34 on is quicker than average. Its impressive to do that good on TT:s with your body type. I always feel like a sealing when doing flat TT:s but you’re beting me by far! 190cm and 62kg is pretty deff..
any advice for the avg. joe who wants to ride his first 100 with a buddy? ( just a good olboy ride not racing) also sounds as if you need to be a dietitian. to know what to eat before during and after. Hi Bill. I’m definitely not an expert and probably more of an average joe. I’ve always cycled for fun and usually solo and switched to a road bike from mountain biking just under 3 years ago. I still like to put plenty of hills in my routes. I used to cycle to my previous place of work which really helped my cycling in the past and I can feel the difference now! I normally do about 50 miles on a Sunday (18mph) when I get the time and try to get 2-3 rides in the evenings of 15-25 miles. I’ve done a couple of century rides in the past and did my third one today which took just over 6 hours (av. 16mph). I got up at 6am and had some porridge with raisins and sugar and drank about half a pint of water. I like to carry everything I need and not stop at shops, so I had 1ltr of fruit juice (plenty of glucose/sucrose) and 1ltr of ‘powerade’ (salts, etc) on the bike and the same again in a rucksack. On the ride I ate about 10 choc chip cookies and 3 cereal bars (more carb than fat type), but I had mnore with me. I didn’t need the 2nd litre of powerade as it was a fairly chilly start. I made sure I kept the power down on the steeper inclines, but I don’t use a speedometer or clock, and so probably was still a bit enthusiastic early on. I struggled a bit in the last 5 miles which felt like general tiredness of my thigh muscles and needing to think about breathing harder rather than any real energy deficieny? My shoulders were aching more than normal as they took a bit of a hammering on some rough tarmac for about 10 miles early on as well. When I got home I made a big whey protein shake and then had a couple of chesseburgers! I sometimes do evening rides after not eating since breakfast to try and encourage my body to get used to not having a constant supply of carbs. I also tend to just stick to just 2-3 good sized meals a day without snacking. I only hit the sugar whilst riding. It is a fast course. But, I weigh only 61kg and possibly power meter underestimates. This may give hope to everyone…but – I have cycled distances with no more than 40 mile rides. A strong mentality can be enough. Always worth challenging yourself as they say ‘the best cyclist in the world hasn’t yet sat on his/her bike’. great read how about a winter ride together level 2! meet Oxford or halfway to Chelt ?